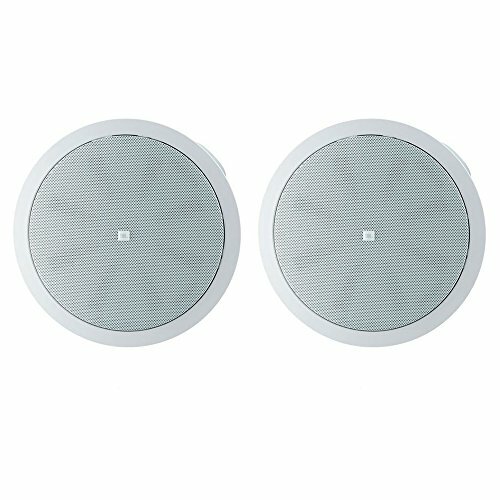 Two-Way 5.25" Coaxial Ceiling Loudspeaker The Control 45C/T is a premium in ceiling professional loudspeaker designed for applications that can benefit from extremely wide bandwidth and very consistent coverage from a ceiling speaker with a small footprint. Consistent 120 Degree broadband pattern control featuring JBL's exclusive conical Radiation Boundary Integrator (RBI) technology. Coaxial design featuring: 130 mm (5.25 in) polypropylene-coated paper cone with butyl rubber surround. 20 mm (.75 in) soft-dome tweeter on 210 mm (8.25 in) diameter wave guide. Bass extension down to 55 Hz. 8 Ohm and 70V/100V operation. Integrated back can for easy "blind-mount" install. Packaged with grille and tile rails for easy installation.